The Rengeoin Sanjusandgendo Temple is the famous temple of 1001 life sized statues of Kannon Bodhisattva. Kannon resides in the center of the temple flanked on each side by 500 bodisatvas in 10 columns of 50. Rengeoin means Temple of the Lotus while Sanjusangendo literally means hall of with 33 spaces between columns, significant because Kannon has the ability to transform into 33 different shapes of mercy. Together with her statues, or arms, they can create 33,033 possible forms. 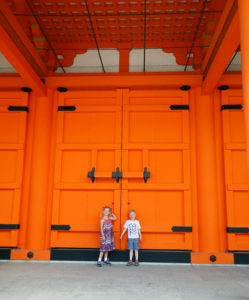 Covered in orange to ward off evil spirits, magical powers and to protect against destruction and calamity, the entire grounds are surrounded by large gates. The entrance to Rengeoin Sanjusangendo is off Nishinomoncho street, across from the Kyoto National Museum. 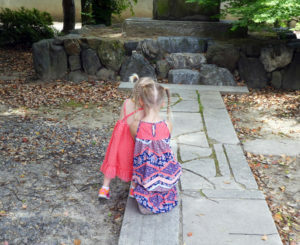 Of the 50 some odd temples, shrines, and monasteries we visited in Kyoto, this was our family’s absolute favorite. There is an unparalleled serenity contained here. It was breathtaking; an incredible sight of devotion and dedication. 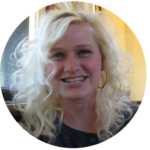 For our family, it represented lost characteristics in our current culture. A homage to quiet reverence and reflection. 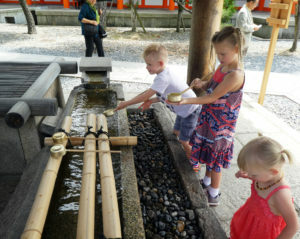 It was a great teaching moment to be able to share the experience of the Rengeoin Sanjusangendo with our children, further impressing upon them that there is a time and place for everything. The grounds are quiet, and beautiful, but quite unimpressive standing in the shadow of the temple in comparison. 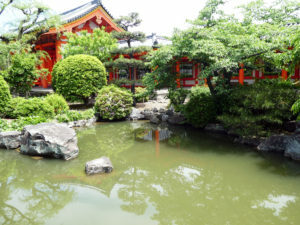 They include a chozuya (purifying station), a pond, and historical markers. You can bypass all this and enter the temple directly, but there is something to taking in the ambiance and the sacred nature and grandeur of what this place is, and imagining what it once was. By reading the marker signs and descriptions we were able to teach our children about what each building signified and was used for. The Monks who walk the grounds regularly at Rengeoin Sanjusangendo completed the experience. The temple and grounds were completed in 1266, reconstructed after a fire burned all but 124 of the statues in 1249. Originally Emperor Goshirakawa founded the temple in 1164. Inside the temple you must remove your shoes and stow all belongings. You are not allowed to take any pictures whatsoever, and if you are caught with a camera, you have to surrender it. The hall is astonishing. There are a mere 33 pillars in the 394 feet hall (hence the name) it is an architectural wonder. 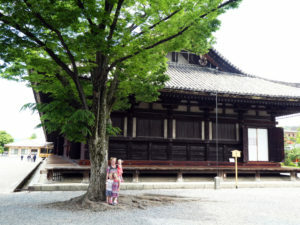 It is the largest wooden structure in all of Japan. 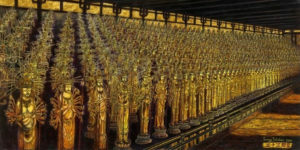 Each statue is identical to the next except for minor facial expressions and folds of the robe, though it is said guests come to the hall to find the face of a loved one. 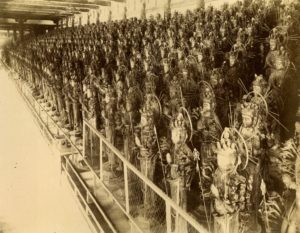 Like Kannon herself, they each posses 20 arms. They are composed of Japanese cypress and adorned in gold leaf. They are poised on raised platforms so every single one is visible from the floor below. At either end of the great hall are two temple guardians standing on a cloud: Raijin, the god of thunder, and Fujin, the god of wind. In front of the statues are 28 deities that represent virtues such as beauty, wisdom, prosperity, charity, justice and strength and bring goodwill to those they encounter. Halfway through the hall, after 500 statues, you come to the spectacular Buddha. This is Kannon. She sits on a lotus flower towering at 11 feet tall, with 11 faces; one normal head, and an additional 8 representing each direction and 2 more for heaven and earth. The figure itself has 20 arms, each hand holding an object of spiritual significance. Here you can offer a prayer and light incense. If you time it right, you may be able to watch a candle lighting ceremony. Potentially, more impressive is that since the 17th century the great hall of the Rengeoin Sanjusangendo is home to the Kyudo tournament: Toshiya, an archery contest. 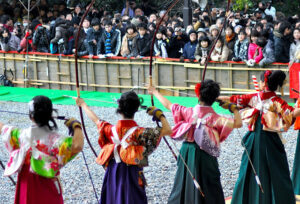 The contest has evolved over the years, but originated as an archery marathon. Each contestant was required to make their own bow and arrow and shoot consecutive arrows for 24 hours straight. The 1686 winner hit the target with 8,133 of 13,053 arrows he shot. The contestants arrow must travel the entire distance of the hall to hit the target, 394 feet. In our current culture of mediocrity the contest has evolved to allow archers to shoot two arrows in two minutes at a distance of 150 feet. If archers hit targets with both arrows, they proceed to the next round. We found ourselves wondering if we have found the balance between pushing our children to their potential, or allowing them to skate by. Fortunately they are young and we still have some time to try and figure that out. ► For Kids: Yes. This is a beautiful place of solemnity and reverence, teaching cultural significance and history. Children are expected to be quieter. Our kids did have a slightly difficult time being as quiet as they were expected to be in the hall, especially our 2 year old. The hall is large, and to take it all in, it’s not a quick visit. Each deity is accompanied by a plaque that explains what they represent and Kannon is a sight to behold. For our older twins they enjoyed reading which virtue each deity possessed, but in turn that also made it harder for the baby. On top of that, it’s very warm in the great hall. We had to remind her over and over if she was quiet we’d go get an ice cream – it mostly worked. Check out our Diapers On A Plane Japan Vlog, and other adventures in Kyoto! ► Nap-time Version: The Rengeoin Sanjusangendo is a Buddhist temple housing 1001 statues, including Kannon Bodhisattva. It is stunning, beautiful and inspiring. It must not be missed. Have you visited this temple in Japan? Was it your favorite? Let us know which one you impacted you the most! Next articleOur Family Trip to Tokyo Disney Sea, Japan: 6 out of 6 Disney Theme Parks Accomplished!